Home ♦ Build ♦ The M4 GTS Is The Fastest BMW Ever! 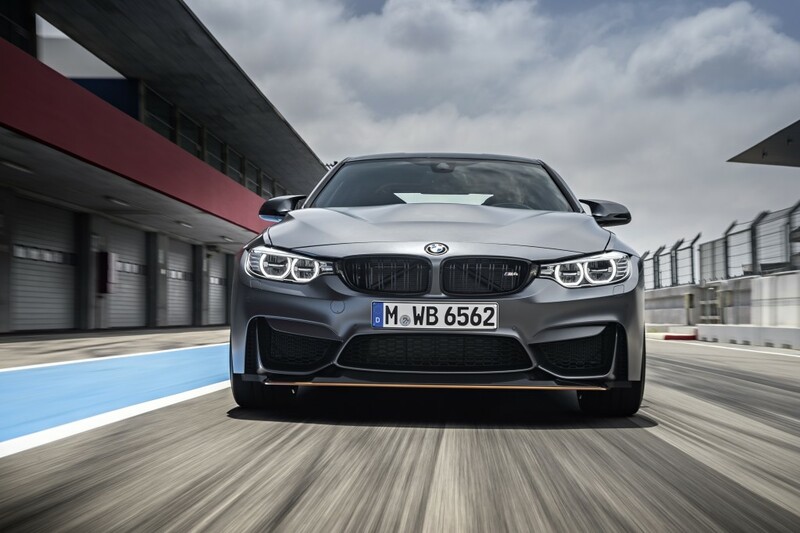 The M4 GTS accelerates from 0 to 62 mph in 3.8 sec, 0.3 sec quicker than an ordinary M4 (with M-DCT paddle shift transmissing) making it the fastest production BMW to ever hit the streets. Power has been increased to 493hp/442tq, and the car now laps the ‘Ring in 7:28 seconds – nearly 30 seconds faster than the regular M4. The good news: 300 models are coming to the US. The bad news: they are all paddle shift transmissions. 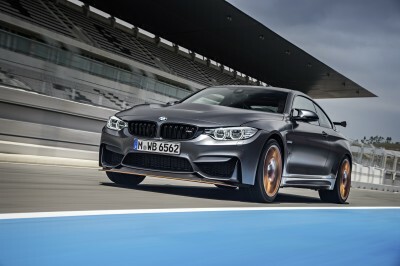 The top speed continues to be limited, like all BMWs, except the M4 GTS limiter is set at 190 mph. You also get a set of coilovers with three way adjustable dampening – the compression adjustment has a setting for high and low speed and then rebound gets its own adjustment for a total of three. Naturally, carbon-ceramic brakes are standard. But, they better be given the retail price of the GTS: I haven’t seen a US price, but other sources are saying the car will cost £121,700 in England. That is approaching $200,000 at the current exchange rate. The rear seats have been removed and it looks like a roll bar has taken their place. It will be interesting to see whether the bar, which is part of a “Club Sport Package,” makes it over to the US. The GT3 RS that Porsche brought to the US was missing the roll bar even though it was standard on the European version. The car is also fitted with a water injection system meaning your trunk now carries a 1.3 gallon water tank. You also get carbon front race seats and a carbon reinforced plastic hood which is 25% lighter than the aluminum equivalent. The roof is also made of the same plastic material. You can only get the car in three colors: Sapphire Black metallic, Alpine White and Frozen Dark Grey metallic. Here’s the complete gallery of M4 GTS pictures. I have to admit it looks cool, but it better for the price. 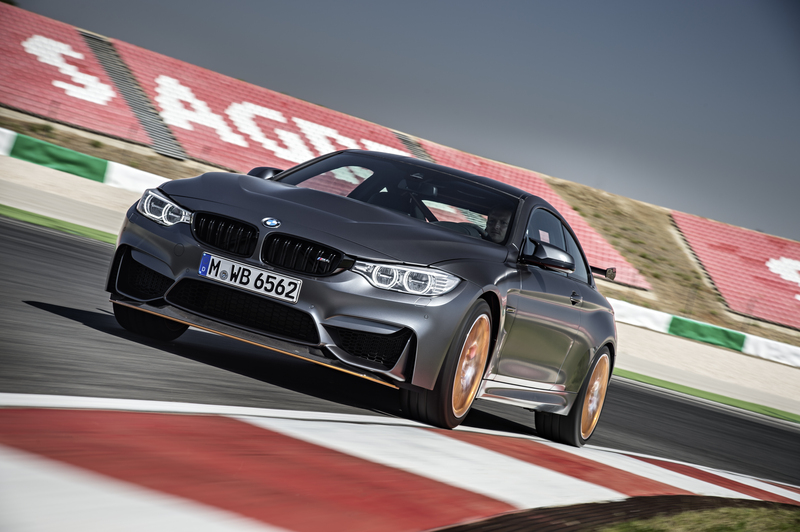 BMW today announced the new 2016 BMW M4 GTS giving BMW M GmbH a new and exclusive technological masterpiece which elevates the potential of the BMW M4 Coupe to an impressive new level. With its powerful, motorsport-inspired looks and high-performance technology, the BMW M4 GTS has its sights set squarely on the race track. 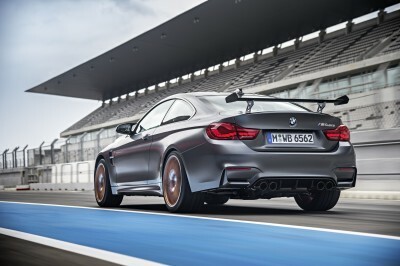 Thanks to an innovative water injection system helping boost power to 493 bHP and track ready chassis, this Special Edition M vehicle recorded a lap time of 7 minutes 28 seconds around the legendary Nürburgring-Nordschleife, the world’s most challenging race circuit, making a clear statement about this model’s exceptional dynamic abilities. 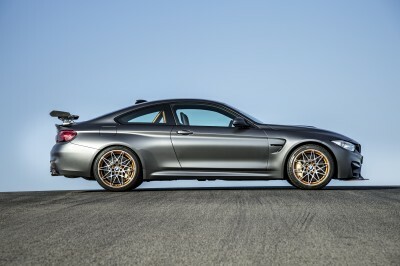 At the same time, the sharpest BMW M4 of all can also hold its own on public roads. 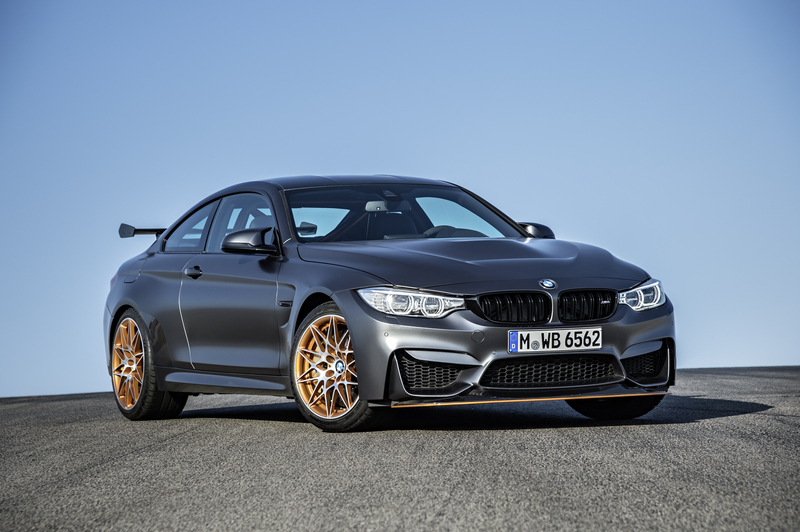 BMW M GmbH is launching the BMW M4 GTS in a special edition limited to 700 units worldwide, with 300 units of this high-performance Special Edition M4 available for the first time in the US market. In so doing, it is highlighting the innovative flair of the BMW M engineers in developing trailblazing M technologies on the powertrain, chassis and lightweight construction fronts. This is where the BMW M division’s solution comes in: if water is injected in a fine spray mist into the intake plenum chamber, it is possible to reduce the temperature of the intake air by an additional 80° F. This further cooling of the pressurized air makes it possible to advance the spark timing closer to the optimal value. This results in a more efficient combustion process, while at the same time reducing the final combustion temperature. An additional advantage is the fact that cool air is more dense which increases the amount of oxygen in the combustion mixture and results in a higher mean combustion pressure, leading to optimized power and torque development. This efficient in-cylinder cooling system also reduces the thermal stress on a broad range of components including not only the pistons, exhaust valves and catalytic converter but also, due to the lower exhaust gas temperatures, the turbocharger. Using water injection to raise the knock threshold also goes a long way towards resolving a fundamental conflict in the design of high-performance engines, caused by the fact that power output and fuel consumption are closely dependent on compression ratio. This is particularly true in the case of highly turbocharged engines like the M TwinPower Turbo 6-cylinder in-line engine. Here, a high compression ratio provides high efficiency and low fuel consumption at low and medium throttle. In the full-throttle range, however, the compression ratio is limited by the knock threshold. Water injection provides a particularly effective way of raising the knock threshold, allowing for a higher compression ratio. The end result is optimized power output over a wide operating range. 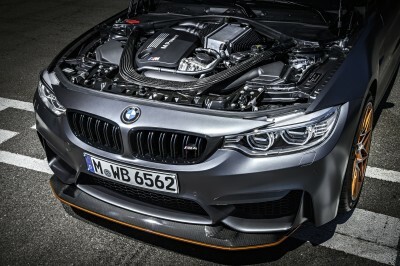 The BMW M division’s engineers opted for an arrangement of three water injectors in the intake plenum chamber where each supply water to two of the straight-6 engine’s cylinders. This solution makes for uniform water distribution and a compact system design. 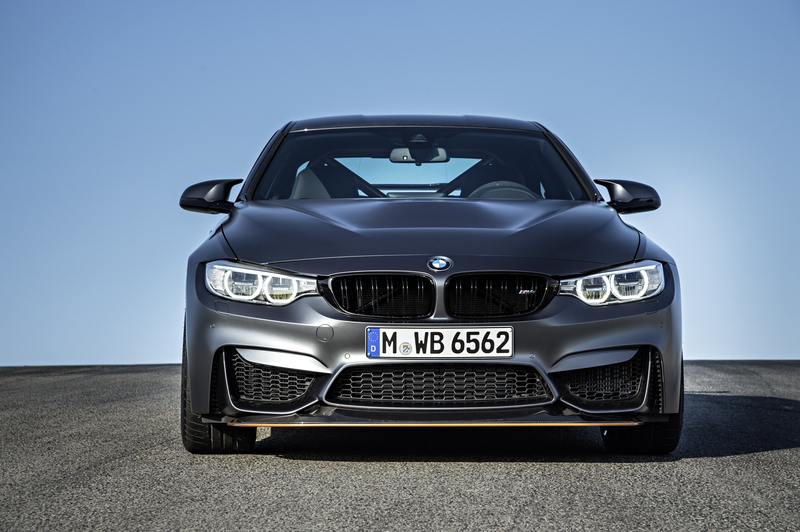 The BMW M division specializes in developing cars that combine precise steering, outstanding agility with a refined driving experience and superb traction and stability. All BMW M models – including the new BMW M4 GTS – unite excellent track capability that has been tested on the Nürburgring Nordschleife (North Loop), the most challenging racing circuit in the world, with high standards of everyday driveability. At the same time, the BMW M4 GTS’s enhanced performance and track capabilities are backed up by additional refinements on the chassis front. Aluminum and Carbon-Fiber construction support the “Ultimate Driving Machine”. The BMW M4 GTS features a three-way adjustable coilover suspension with mechanically adjustable compression and rebound settings, with precise independent adjustment of low-speed and high-speed compression. This allows the suspension to be customized to the characteristics of different tracks. Moreover, the anti-roll bars and support mounts are closely matched to the significantly increased engine power and are specifically designed for the “Ultimate Driving Machine”. 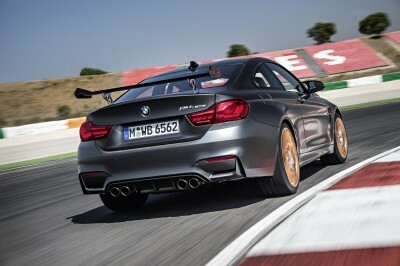 The steering system has also been adapted to the BMW M4 GTS’s track capabilities. The steering torque curve, always critical for a smooth steering feel, has been further optimized by modifications to the front suspension kinematics and the incorporation of features such as asymmetric steering support mounts and a motorsport-derived, custom-designed, milled swivel bearing. This design allows optimized axle geometry for lateral dynamics and steering torque, which again translates to enhanced driving dynamics. Other features helping to add an extra edge to the driving dynamics include the rear differential’s hollow lightweight output shafts and the Active M Differential. To optimize traction and stability, the latter uses an electronically controlled multi-plate limited-slip differential, which is adapted to the significantly enhanced performance capability of the BMW M4 GTS. The multi-plate limited-slip differential is proactively controlled with extremely high precision and speed. Its control unit is linked to the Dynamic Stability Control (DSC) system and takes into account accelerator pedal position, wheel speeds and vehicle yaw. All driving situations can therefore be precisely analyzed and an imminent loss of traction at one side of the vehicle is identified at a very early stage. When necessary, the system reacts with split-second speed to vary the locking action, which can be anywhere between zero and 100 percent. This prevents wheel spin on low-traction surfaces, on split-traction surfaces with a big difference in friction coefficient between the left and right rear wheels, on tight hairpin bends or during fast steering maneuvers. The optimized traction also provides superb stability in challenging conditions and allows to optimally transfer the power to the ground while accelerating out of corners. 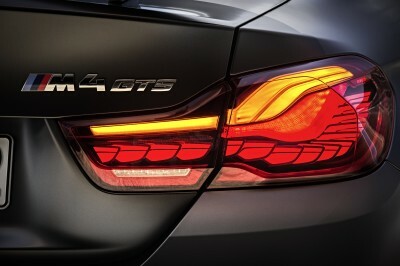 M Dynamic Mode (MDM), a special DSC mode, can be activated whenever drivers want an extra-sporty driving experience. Whereas DSC focuses on correcting understeer or oversteer, M Dynamic Mode allows more wheel slip for controlled drifting. This mode caters to sporty-minded drivers, although – unlike DSC OFF mode – the system still intervenes if the vehicle reaches a critical stability threshold. The DSC system and the Anti-lock Braking System (ABS) have been configured to take into account the BMW M4 GTS’s increased performance and its newly developed three-way coilover suspension. Tire development was integrated into the suspension set-up right from the start. 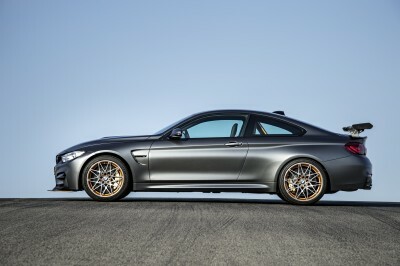 For high-performance sports cars like the BMW M4 GTS, steering feel and precision are a particularly important priority when developing the front tires, alongside lateral stability and the transmission of braking forces, while for the rear tires the focus is on traction, lateral stability and directional stability. To meet the very highest dynamic standards, the BMW M4 GTS is equipped with low-weight, high-stiffness forged wheels running on mixed-size Michelin Pilot Sport Cup 2 tires (front: 265/35 R19; rear: 285/30 R20). The 19-inch front wheels (9.5 J x 19) improve steering precision, while the 20-inch (10.5 J x 20) rear wheels provide outstanding traction and an optimal transfer of drive power to the road. The Cup tires complement the fine-tuned suspension set-up by ensuring optimal traction and precise feedback for exceptionally agile handling. The electromechanical steering system was also developed in-house by the BMW M division. Strong points of this specially configured steering system, which forms the key control interface between driver and vehicle, include its direct steering feel and precise feedback. To further improve driver feedback, BMW M engineers opted for no elastic section in the BMW M4 GTS steering column. The integrated Servotronic function electronically adjusts the level of power assist according to road speed, providing optimal steering characteristics at all speeds. The Servotronic button on the center console offers three different settings, each with its own specific profile: COMFORT, SPORT and SPORT+. These settings can be programmed into the M1 and M2 buttons in the M Drive menu. They can then be activated while driving by pressing the appropriate steering wheel button. In each case the level of steering assistance is adapted to the current requirements and the driver’s personal preferences. 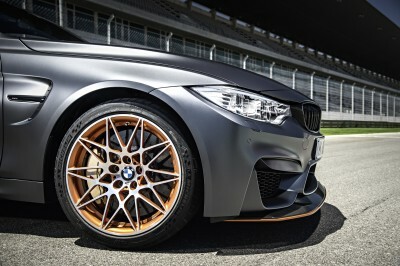 Nürburgring Tested – Ultra-high performance M Carbon Ceramic Brakes. 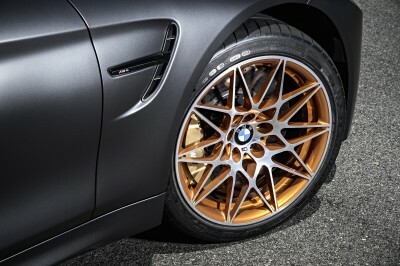 Visually, the M carbon ceramic brakes can be distinguished by their gold-painted 6-piston (front) or four-piston (rear) brake calipers with colored M logo. Particularly during high-performance driving on the track, they boast excellent modulation, outstanding deceleration capabilities and stable, fade-resistant performance. Being much lighter than a conventional brake system, they also contribute to the all-round reduction in unsprung masses and therefore also enhance driving dynamics. 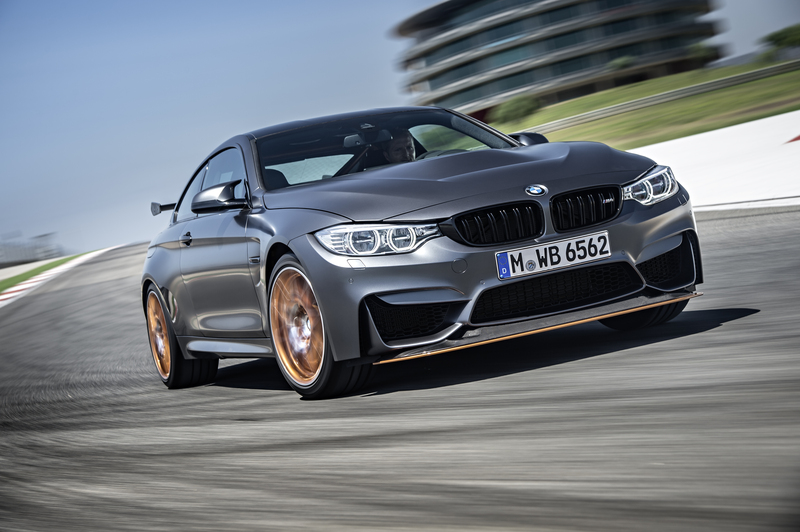 Intelligent lightweight engineering, already a vital consideration for the BMW M4, has been taken to new and even more uncompromising levels on the BMW M4 GTS. The goal was to minimize curb weight in order to give the new model outstanding driving dynamics, top-class agility and highest efficiency. 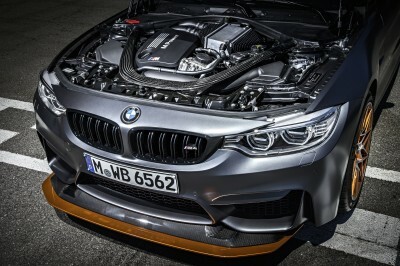 Rigorous weight reduction measures include even the smallest details of the BMW M4 GTS, delivering a DIN curb weight of 3,329 pounds (ECE curb weight: 3,494 lbs). Its outstanding weight to power ratio of roughly 6.5 lbs/hp provides the perfect platform for a highly dynamic driving experience. 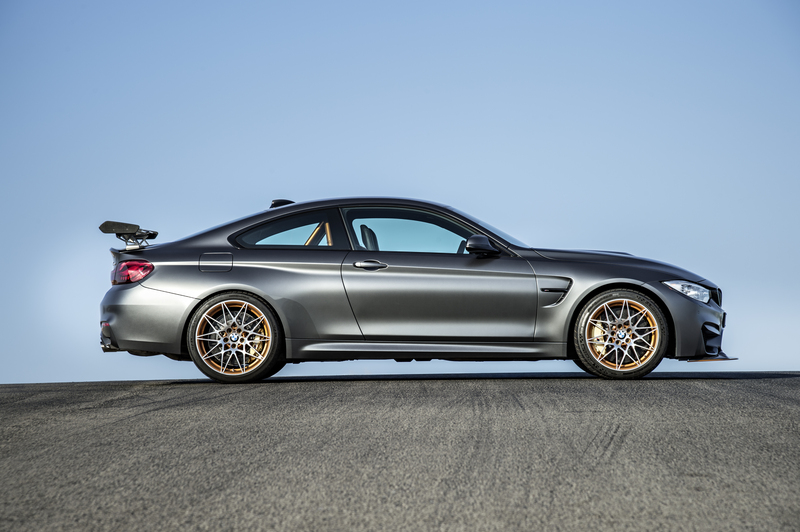 Like the BMW M4 Coupe, the BMW M4 GTS has a carbon-fiber-reinforced plastic (CFRP) roof that is more than 13 pounds lighter than a corresponding metal roof. 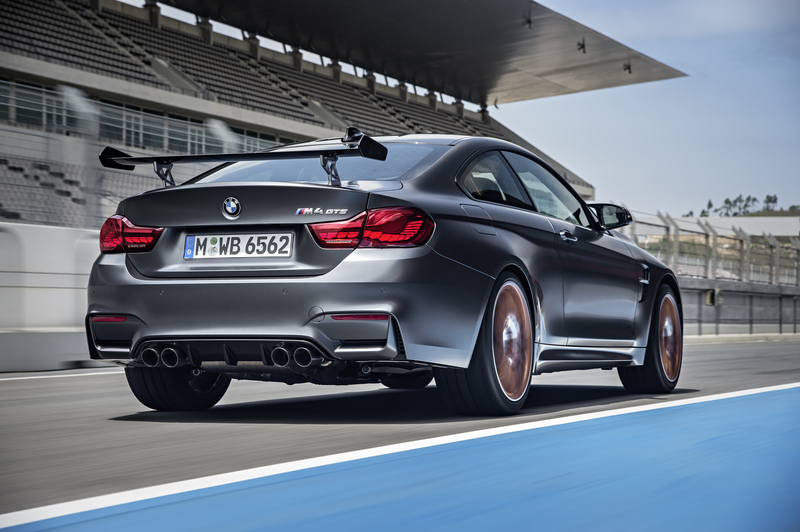 Lightweight, robust CFRP is also used for the hood, which is approximately 25 percent lighter than its aluminum counterpart on the BMW M4. Both of these lightweight components play an important role in lowering the center of gravity (CG) and improving axle load distribution. In the BMW M4 GTS, BMW reaps the benefits of its many years’ experience in high-tech carbon construction. The use of CFRP continues under the skin as well, for example in components such as the instrument panel support. Lightweight exposed carbon fiber is also on display in the adjustable splitter underneath the BMW M4 GTS’s front apron and in the rear apron diffuser. 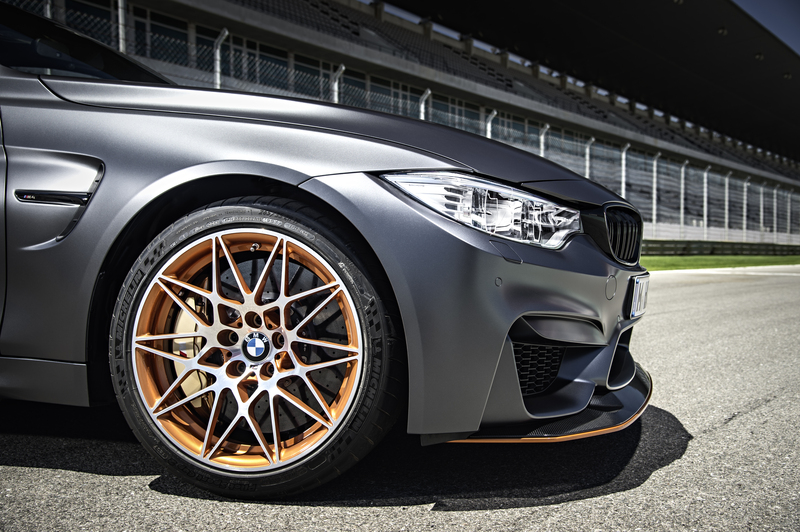 Exterior lightweight design measures continue with the exclusive forged, machine-polished, low-weight BMW M star-spoke wheels in Acid Orange and the M carbon ceramic brakes, both of which not only cut down on overall weight but also significantly reduce unsprung masses. 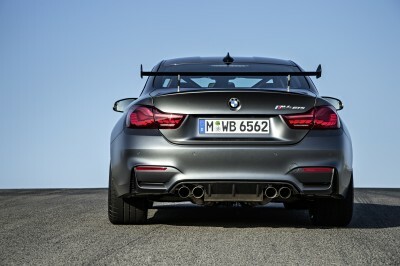 The M engineers have also extended their uncompromising focus on lightweight engineering to the sports exhaust system, which features a titanium rear silencer. The BMW M4 GTS’s sports exhaust system produces an authentic racing engine note while providing a 20 percent weight reduction when compared to a stainless steel component. Needless to say, lightweight engineering is not just confined to the visible areas of the body. For example, the BMW M4 GTS’s single-piece driveshaft is made of carbon-fiber-reinforced plastic (CFRP), which is even lighter than the corresponding component in the BMW M4. The low mass and high stiffness of the CFRP means that the driveshaft can be produced as a single-piece component, without a center bearing. This achieves weight savings of 40 percent over a conventional component, with a simultaneous reduction in rotating masses. This in turn results in improved powertrain dynamics and better response. The many lightweight features in the interior of the BMW M4 GTS don’t just save weight, they also exude an authentic racing feel. This Special Edition vehicle is fitted with different bucket-style M sports seats in Alcantara (including lightweight backrests with cut-outs). In between the seats, the BMW M4 GTS boasts a new, asymmetrically styled lightweight center console that shaves around 30 percent off the weight of the corresponding component in the BMW M4 Coupe. Viewed from the front, the visual features that stand out the most are its muscular contours and the prominent three-dimensionality of its lines, which lend it a particularly expressive face. 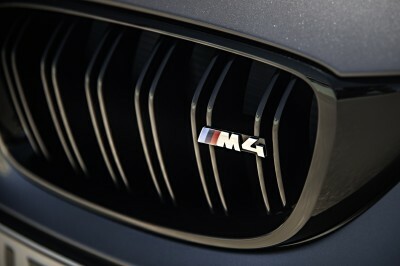 Characteristic design elements, such as a cutting-edge design take on the familiar twin circular headlamps with LED technology, the eye-catching front grille with M double bars in black and the powerfully sculpted front apron with its trio of large air intakes, dedicated to cooling the high-performance engine and brakes, immediately set it apart as the work of BMW M and spotlight its even more sportier pretensions. 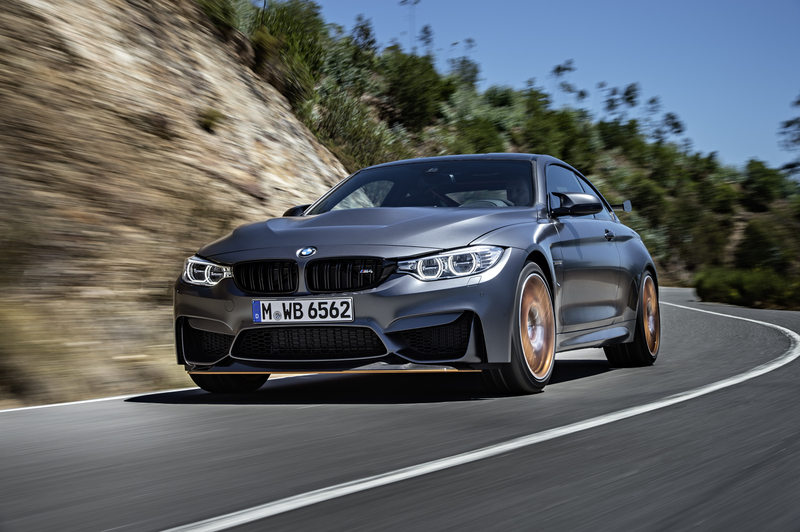 Needless to say, the BMW M4 GTS also features the striking M exterior mirrors in twin-stalk style and hallmark powerdome on the hood. 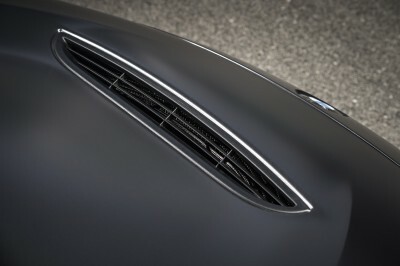 The carbon-fiber-reinforced plastic (CFRP) hood is painted in body color and features a large air outlet. Thanks to the use of CFRP, the hood weighs 25 percent less than an aluminum equivalent, which helps both to lower the car’s center of gravity and further improve the balance of weight between the front and rear axle. The air outlet on the hood optimizes the airflow and reduces lift at the front axle. The front end’s weight-minimized splitter is made from lightweight exposed carbon fiber, has a contrasting stripe in bright Acid Orange running along its leading edge and can be set in two positions for road or track. The splitter divides the surging air, channeling part of it deliberately under the car to optimize aerodynamics. Here, the airflow is accelerated on its way to the carbon-fiber diffuser at the rear. 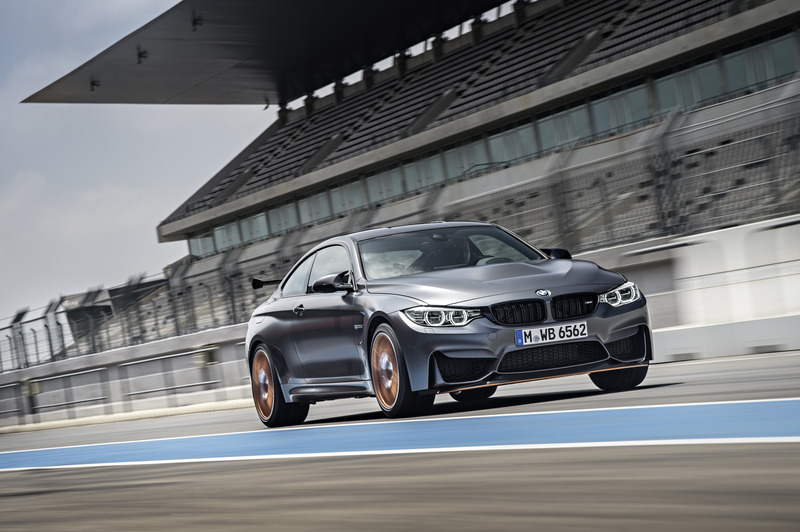 The flanks of the BMW M4 GTS pick up the dynamic verve of its front end and extend it rearwards. Hallmark BMW proportions – long hood, long wheelbase, set-back greenhouse, short overhangs – are emphasized by M design elements. 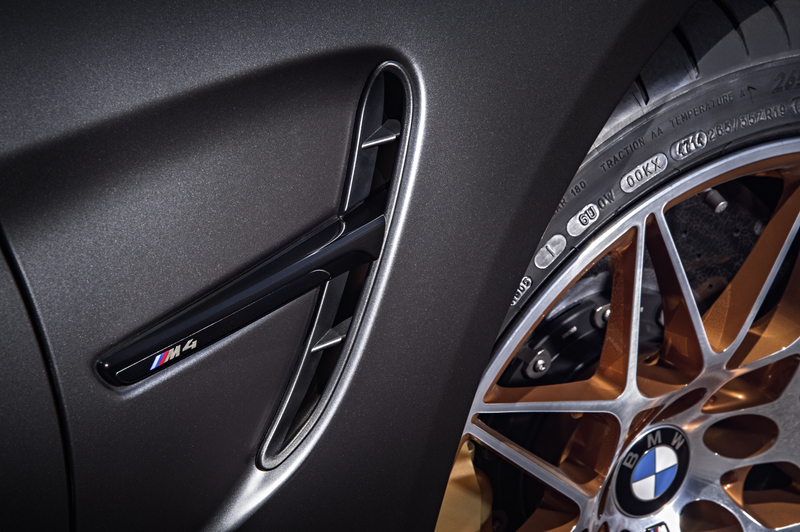 Muscular wheel arches and dramatic surfacing translate the dynamic potential of the BMW M4 GTS into tangible form. This potential is accentuated by the M gills – in high-gloss black like the kidney grille surround – which fulfills both a stylistic and functional role. The gills house Air Breathers, which team up with Air Curtains in the front apron to optimize airflow through the wheel arches and enhance aerodynamics in the process. 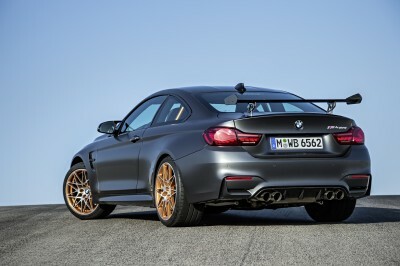 The combination of a dark-colored, clear-coated CFRP roof and contoured roofline gives the BMW M4 GTS a hunkered-down look, with the cant rails painted in body color perceived as the car’s highest point. The flowing roofline lends an extra touch of elegance to the ultra-sporty appearance of the BMW M4 GTS. 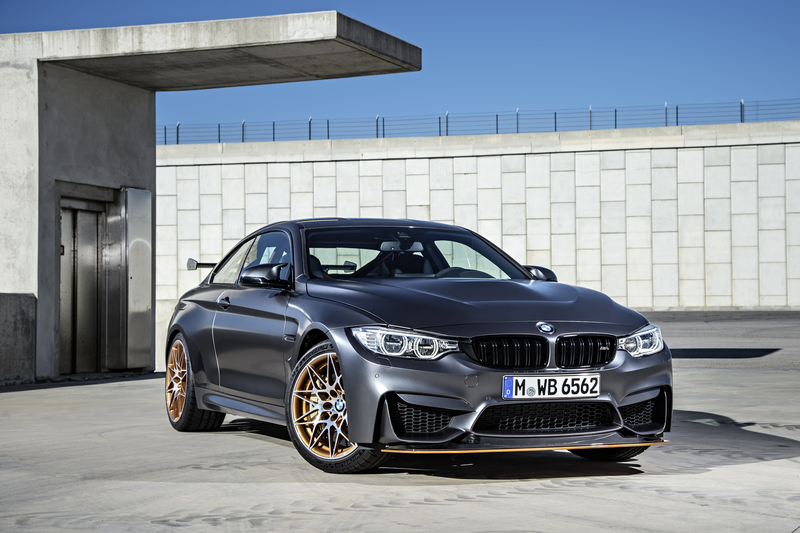 The large, forged M light-alloy wheels, featuring distinctive star-spoke design in Acid Orange and polished surfacing, appear to fill the wheel arches even more completely and give the BMW M4 GTS a compact, powerful appearance. The car’s lines pick up speed again as they stream rearwards, accentuate the body’s aerodynamic flow and, at the same time, add muscle to the rear end. The back end of the BMW M4 GTS can be distinguished clearly from that of the BMW M4 Coupe. On the trunk lid, for example, an adjustable carbon-fiber rear wing resting on intricate, CNC-machined aluminum struts provides a head-turning design feature. The rear wing can be adjusted through three positions – one for road driving and two others that can be selected according to individual preference on the track. Identifying features of the BMW M4 include the flared rear wheel arches which, together with the car’s wide track, underline its confident appearance. The double-chamber exhaust system, with its two pairs of tailpipes, is another signature BMW M feature. 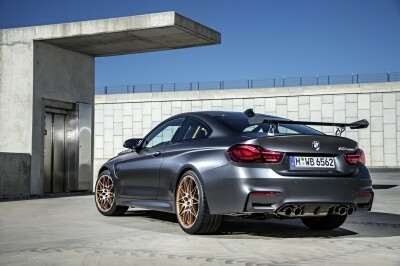 Here, the titanium tailpipes – with their 80-millimeter diameter and laser-engraved M logo – are another reference to the standalone character of the BMW M4 GTS. They are framed by a clearly structured rear apron and flank the exposed carbon-fiber diffuser. The diffuser forms a single aerodynamic unit with the rear wing and front splitter, which is likewise made from carbon fiber. They work together to optimize airflow and, in so doing, improve downforce and roadholding. 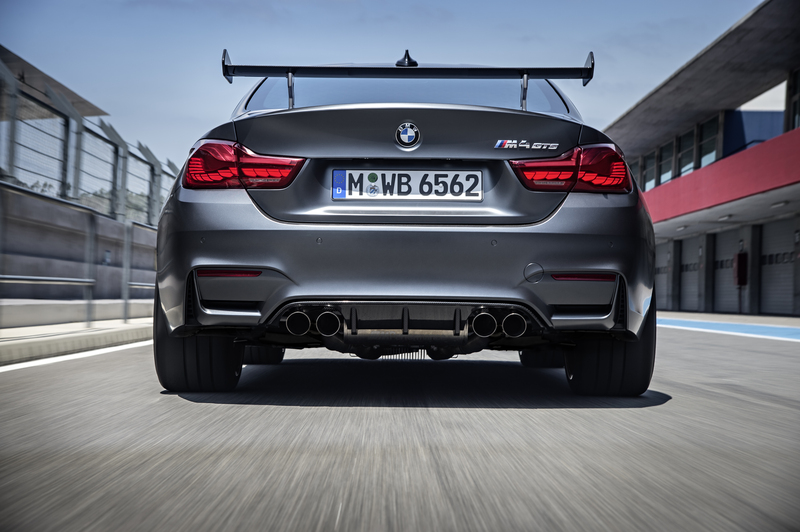 The trunk lid of the BMW M4 GTS also performs an integral aerodynamic role. Its specifically contoured lines channel the air at the rear of the car and improve airflow to the rear wing. In this way, the pair of lines spawned by the powerdome on the hood and extending over the CFRP roof in clearly defined contours reach their journey’s end at the trunk lid. The M sports steering wheel, likewise covered in exclusive, anthracite-colored Alcantara, represents a clear nod to motor racing and is exceptionally grippy. A perforated stripe in contrasting Acid Orange at the “12 o’clock” position on the wheel marks the steering’s central positon, which comes in handy when the driver is pushing hard on the track. 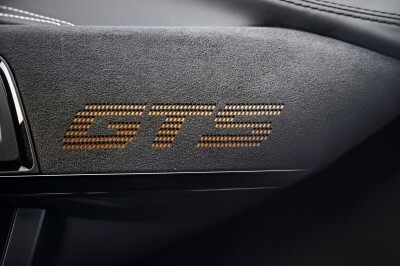 The Alcantara-covered interior trim strip has a perforated GTS badge with Acid Orange highlighting. The new center console of the BMW M4 GTS is asymmetric in design and lightweight in construction. Like the handbrake lever gaiter, it is covered in anthracite-colored Alcantara with edging adorned with dark grey contrast stitching. 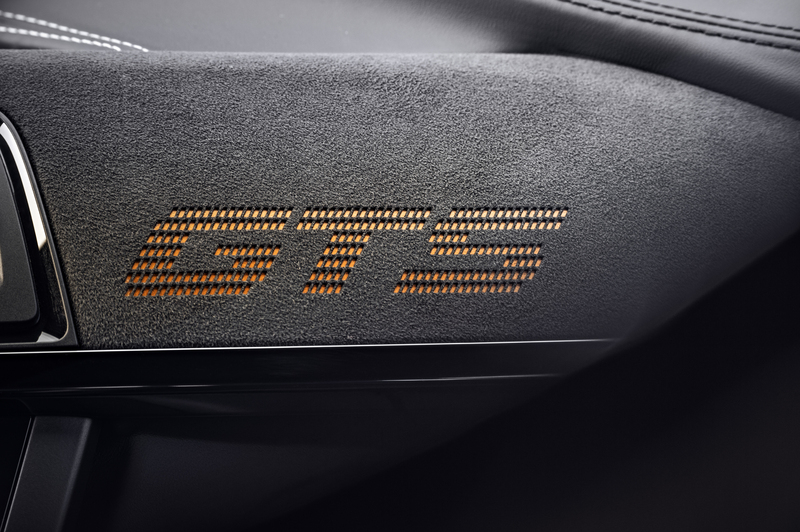 The interior door panels and rear side panels also include lightweight design elements produced specially for the BMW M4 GTS. These display a new, purist geometry and are made from renewable raw materials. For example, the handles normally found on the inside of the doors are replaced here by pull loops which, like the seat belts, also come in black and feature longitudinal stripes in the signature M colors. Together with the Alcantara covering used for the armrests only, the door trim deepens the stripped-back and purpose-driven character of the interior. The omission of a rear seat bench takes this approach to another new level. The rear seat surfaces are replaced by an innovative glass-fiber-reinforced plastic (GFRP) shelf, combined with a rear panel made in a carbon-fiber sandwich construction. Lowering the car’s weight and center of gravity, while also ensuring unbeatable rigidity, once again took priority here. A central feature of the interior is the roll bar, which is made from high-strength steels and mounted behind the front seats. 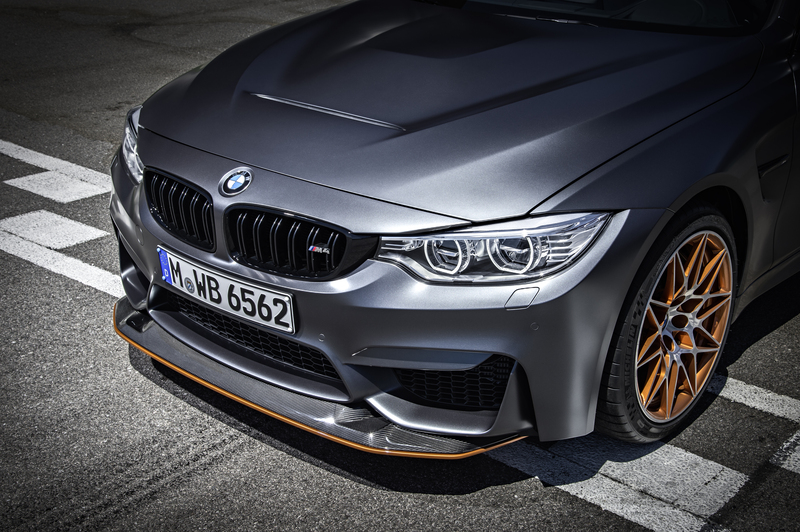 Its Acid Orange paint finish provides another color accent, and its influence is not confined to the interior; visible from the outside, it also helps shape the overall perception of the BMW M4 GTS and signals the car’s sense of purpose and racing intent. A fire extinguisher containing two kilograms of extinguishing agent is another safety feature of the interior. It is fitted centrally behind the front seats within easy reach of both driver and passenger.